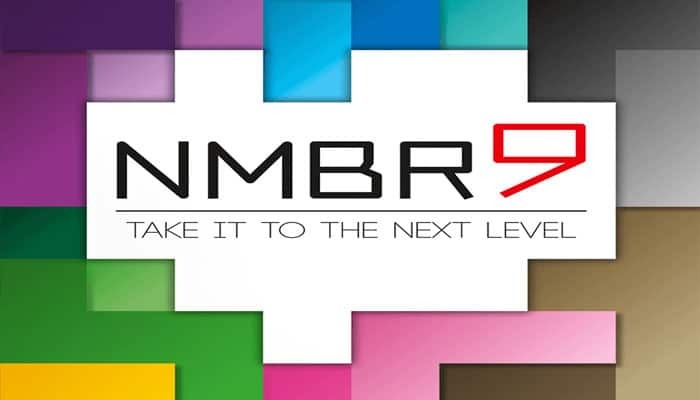 In NMBR 9 , players use number tiles to build their displays. Tiles on higher levels are worth more points, and at the end of the game, the player with the most points wins. Store the tiles in the black tray, sorted by number and easily accessible to all players. Shuffle the deck and place it facedown near the box. As you build your display, you will place tiles on the table and on top of other tiles. All tiles directly on the table are on level 0. Any tiles directly on top of level 0 tiles are on level 1, tiles directly on top of level 1 tiles are on level 2, and so on. Each tile shows a grid to guide how it can be placed on your display. When you place a tile, it must align with the grids of your other tiles. One player flips the top card of the deck and places it faceup near the deck. 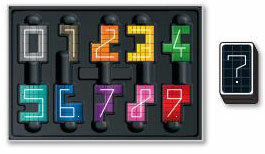 Then, each player takes one tile matching the number shown on the flipped card. Place your tile on your display. Continue flipping cards and placing tiles this way until the deck runs out. Note: You can orient the first tile in your display as you like, however the number side must be faceup. The tile's number side must be faceup. You can orient the tile however you like as long as its grid aligns with the grids of your other tiles. The tile must be adjacent to another tile on its level. Tiles are adjacent if they share an edge (not only a corner). The first tile you place on a level does not need to follow this rule. A tile on level 1 or higher must overlap two or more tiles on the level directly beneath it. No part of the tile can overhang without a tile directly beneath it. While you decide how to place your tile, you can manipulate it as you like. However, once a tile is placed, it cannot be moved. Note: You will need to visualize how future tiles will fit onto your display; you cannot take other tiles from the box to plan how they will fit. 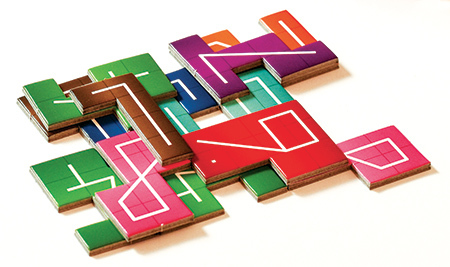 After the last card of the deck has been flipped and players have finished placing the matching tile, the game ends, and players score their displays. To score your display, remove the tiles from your display one at a time, starting with the highest level and moving downward. For each tile you remove, add its points to your total and record the result. Each tile is worth points equal to its number multiplied by its level. Note: The tiles directly on the table (level 0) are worth 0 points. The player with the most points wins! If there is a tie, the tied players share the victory. An "8" on level 2 is worth (8 x2 =) 16 points. 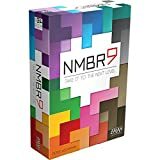 NMBR 9 can be played by a single player. The rules are unchanged; your goal is to score as many points as possible. How high can you score? How high can you build your display?